This article is part of a series written for HTGSupply by plant biologist Dr. E.R. Myers. This is the sixth of a multi-part series on plant growth and liming factors (view other articles in this series ). This month I will discuss carbon and ventilation and next month will conclude the limiting factors series with temperature and water. factor won’t grow at the maximum rate no matter how much of any other factor you give them. To grow better, find your limiting factor which will increase growth, sometimes dramatically, without having to adjust or do anything else. There are several major factors that can limit plant growth, in order of importance they are, light, water, temperature, carbon dioxide and nutrients. Concerning plant growth, everyone thinks about light and the amount of water, but an invisible, colorless odorless gas is often overlooked, even though it is of the utmost importance to good growth, and is so easy to add to an indoor garden. From previous articles you know carbon dioxide (CO2) is needed for plants to conduct photosynthesis. Carbon dioxide diffuses (moves) into the plant via tiny holes/pores called stomata. Diffusion is a passive process meaning the plants can only get as much CO2 as there is in their immediate environment. Stomata must be open for CO2 to get into the plant. Stomata open and close based on plant physiology and in response to environmental factors. If something keeps the stomata closed, the rate of photosynthesis will slow and eventually stop as CO2 becomes limiting. 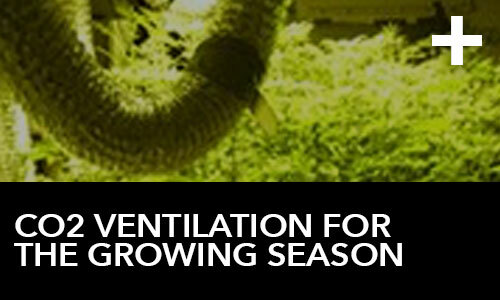 Indoor growers should know that dust or other particulate matter may clog stomata. It might be a good idea to occasionally (monthly or more if there is smoke or dust in the room) mist your plants with water on the top and bottom of the leaves (especially the bottom of leaves where in many plants the majority of stomata are located). Use enough mist so that the water beads up and runs off the leaves. The mist, like rain will wash off the leaf surface and clean out the stomata. This should be done during vegetative growth. If you are producing fruit/flowers that are susceptible to mold, you should not mist the plants once flowers begin to develop. High humidity and misting plants can lead to powdery mildew or other fungal infections. You should mist the plants in the beginning of the light cycle so that the light will help dry the plant leaves. I am sure you know water and electricity don’t mix. BE SURE NOT TO GET ANY MIST OR WATER ON AN H.I.D. LIGHT BULB (ie: MH Metal Halide or HPS High Pressure Sodium bulbs) as it may cause the bulb to crack or break. Although you can’t see individual stomata with the naked eye, most plants, when you look closely have tiny “hairs” on their stems and/or leaves. These protuberances are to trap air around the plant and create a microenvironment trapped air is usually warmer and has more humidity than the surrounding air. In the natural environment this microenvironment is replenished periodically with wind. Without air movement as the plant uses up the CO2 from this microenvironment CO2 can easily become limited. If the air around the plant is not moving, the growth rate will slow with limited CO2. I recommend using some type of circulation fan to move air around the plants . Carbon dioxide availability can first be increased indoors via air flow, so buy a fan before a CO2 tank. Adding light airflow will increase CO2 input and may increase H2O output so hydroponics growers should pay extra attention to the reservoir when adding a fan to the grow area. If you use an HID like many do, you should move the air around the bulb and plants with a fan and/or ventilate your grow area to remove heat. All the greenhouses I have worked in have had ventilation or air exchanges with the outside. Ventilation was needed to remove the heat and moisture coming from the lights and plants. Since ventilation can supply fresh CO2 it seems like a good idea, and it can be. However, keep in mind that if you bring in air from the outside, or even pump hot air outside, you risk getting pests into your garden, which can bring disaster. (look for future articles on pests). You should always screen air intake and exhaust if you are venting to the outside. I use a carbon filter fan combo ( see: Carbon Filters ) to move the air around the room; I direct the outflow air via flexible duct across the bulb and the top of the plants. Doing this keeps the plants safe from the heat of my HID bulb, increases the CO2 via airflow and also keeps mold spore numbers down. A carbon filter could also greatly reduce pollen, so if you are growing fruits which need pollination, or do not want pollen in the room, keep that in mind. Concerning airflow, like any factor you need to keep in mind that too much of a good thing, is not good. You can over stress your plants with wind. Your plants should jiggle in the wind, not be blown over. You can also limit the time the wind (fan) is affecting the plants with a timer. Using a fan to simulate a slight breeze will help increase CO2 and O2 exchange, which will increase your plants photosynthesis rate and yield. I’ve seen some plants placed too close to circulation fans that have suffered “wind burn whereas the leaves of the plants were damaged by the excessive air flow. Plants grown outdoors develop thick sturdy stems due to environmental stress. Wind causes tiny tears on the stem which are repaired, making the stem stronger. It is the same basic idea behind lifting weights to build bigger muscles. Indoor plants benefit from a lack of most environmental stresses, but not having to cope with wind stress results in weak stems. Thigmomorphogenesis (10 cent word eh!) is the term for a stress response to mechanical stimulation that causes most plants to have increased radial stem growth (thicker stems). This mechanical stress can be shaking the plants, or simply having a fan gently blow on the plants. This stress promotes thicker stems and shortened plants. In the wild, being shorter and thick stemmed makes the plants sturdier so they can better stand up to wind. Thus, Thigmomorphogenesis has a beneficial effect, it results in shorter thick stemmed plants, the opposite effect of HPS (yellow/red) lights and high temperatures. I always put a small circulation fan on young seedlings to promote sturdy stems. This helps them hold up the big flowers later in life. CO2 is often limiting before nutrients. Almost everyone spends thoughts and money on nutrients, consider a CO2 tank. (see: CO2 Systems ) If you ventilate your grow area, only vent your room if your CO2 system is off and make sure you let the plants sit in the CO2 for a while. There are many different environmental controllers that turn CO2 on or off with the ventilation system and some that even measure in CO2 the air and regulate the release of CO2. (see: Environmental Controls). In larger areas, you could use a carbon filter to keep down the fungal spores and bacteria, and you might not need to ventilate the area resulting in a self contained high CO2 room. One concern would be the build up of humidity so even rooms with CO2 may need ventilated to some degree. Normal atmospheric CO2 levels (in the air) are between 300 to 500 ppm (parts per million), depending on where you live (urban or rural) with an average of 387 ppm. The earth’s atmosphere contained more CO2 when plants evolved, and plants have not lost their ability to process CO2 at higher rates. In other words, plants with ample light and water will grow faster with higher CO2 in the atmosphere. The amount of CO2 in the atmosphere for maximum plant growth is around 1500-2000 ppm. You should add additional CO2 to increase your growing areas PPM to these levels, keeping these levels can be easy with a Digital Controller. CO2 is heavier than air, and is cooler, so it should always be released above the plants. If you let CO2 go at the soil level, it may just seep out of your room and be unavailable to your plants. The best way to distribute CO2 is directly to each plant with a hose. With a tank and multiple hoses you can have a hose positioned above each individual plant. If you have one hose, you can string it above the plants and put small holes in the tubing so the CO2 seeps out over all the plants. Keep in mind if you make big holes all the CO2 will be exhausted before it gets to the end of the tube. An easier but LESS EFFICIENT possibility is that you can put a single hose behind a fan and spread the CO2 over the area the fan blows. If you do this, you should seal your grow area with caulk in the corners and weather stripping around the doors. The faster the CO2 escapes the grow area the less effective it will be. I have heard of a lot of kooky ways to add CO2 to your grow room, from composting in the grow area, to brewing beer (using yeast) in the grow room to exhausting a gas dryer into a grow room. I understand the desire to use organic or recycled CO2 and honestly any increase in CO2 should increase you plant growth rate. There are products on the market which natural gas or propane in order to release CO2 (See: Environmental Controls). You could even use a gas or kerosene space heater in your grow area if heat is not a problem. Please be careful to not create any fire hazards by doing so. Burning fossil fuels does release CO2 and water vapor as part of the combustion process. On average, one pound of fuel will produce about 3 pounds of CO2 and 1.5 pounds of water. Good heaters should not produce any residue or carbon monoxide (CO) which is a deadly gas. It is the CO in car exhaust that kills people. If you use a fossil fuel heater to add CO2 you should vent the room before you go in to be safe. There are other natural ways to produce CO2 in your garden as well. While I have not used products like CO2 boost (which basically brews sugar and yeast to produce CO2) I believe they will add CO2 but I do not know how long the shelf life is when the CO2 will be generated. Any increase in CO2 can be beneficial, but you need to add it above the plants, most efficiently with a hose. I would suggest you use a CO2 tank with a CO2 regulator and release the proper amount into your room at the proper time. I think that for ease, safety and efficiency having a CO2 tank with a regulator is the way to go. When you advance to using a CO2 tank with timer and valve, you can regulate the amount of CO2 that you have in your grow room. If you increase the amount of CO2 to 0.2% of your rooms atmosphere, that is 2000 ppm. The first thing you need to do is figure out how much CO2 you need to release to bring your grow room to 2000 ppm. To do this determine the volume of your room (length x width x height). You then multiply your room volume by 0.002 (that is 0.2%: if you want 1500 ppm that is 0.0015% multiply your room volume by 0.0015). For example, if your room is 5 feet by 5 feet by 8 feet, your volume is 175 cubic feet (5x5x8=175) and 175 x 0.002 is 0.35. You need to release 0.35 cubic feet of CO2 into the room. Step two, in order to figure out how long the valve should be open the number of cubic feet of gas required (0.35) is divided by the flow rate. If the flow rate is 10 cubic feet per hour divide 0.35 by 10 = 0.035 hours or (0.035x60min/hour) 2.1 minutes an hour (two minutes) That is not a lot of CO2 for a potential doubling of yields. Many timers don’t regulate below 5 minutes (see: Timers ) but you could start off having the valve open for 5 min. every hour and then increase or decrease the amount of CO2 until you see no more increases or reduced growth. As you know by now, giving your plants too much CO2 will not increase growth. You should keep the room sealed as best as possible when the plants are being given CO2. Carbon Dioxide is not toxic to plants, so if you can’t be exact, err on the side of too much. In humans, symptoms of high or prolonged exposure to carbon dioxide include headache, increased heart rate, dizziness, fatigue, rapid breathing, visual and hearing dysfunctions. Exposure to higher levels may cause unconsciousness or death within minutes of exposure. Sound scary? High levels for humans are above 2%, while what I am describing for your plants, a large increase in yields with CO2 at 0.2%, is not even close. Carbon dioxide poses no real danger to you. SmartBee Controllers are a great way to control CO2 in the grow room. Just set it and forget it! So, buy that CO2 tank and regulator or CO2 Generator and send me an E-mail at: askthedoctor@htgsupply.com I enjoy hearing about your experiences.